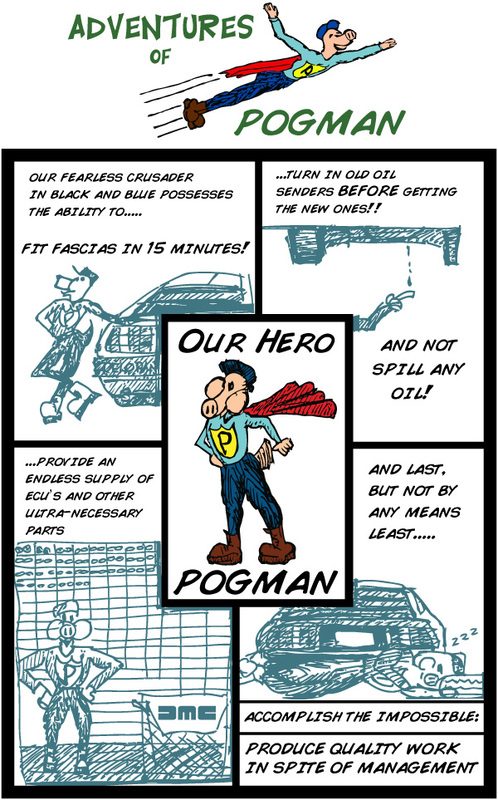 POGMAN is a cartoon character created by fellow POG, Paul Silfven. Paul created the lovable POGMAN and it became an instant hit with the POGs. Paul would sketch these cartoons during his lunch breaks to sometimes illustrate his frustration with management. Throughout the years, we have uncovered a few original comic sketches that Paul put together while working for DeLorean. POGMAN emphasizes the long hours and increasing demands that the POGs endured at the QACs. POGMAN accomplishes his missions and the cars get delivered on time. This unique environment contributes to the unique aspects of DeLorean Motor Company. The dream lives on!